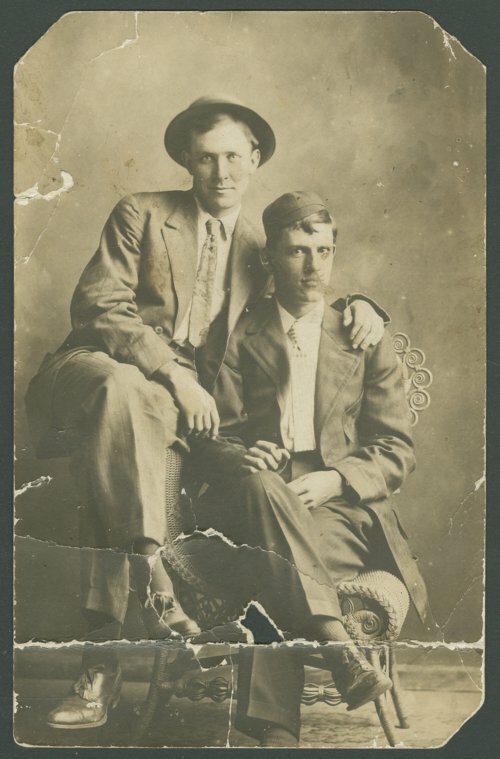 This postcard is a studio portrait of two young men, one of whom (on the right) is possibly Wiley Taylor of Louisville, Kansas. As a young man, Taylor pursued a career in baseball. He started playing professionally in 1910 with the Ellsworth minor league team in the Central Kansas League. Between 1911 and 1914, he pitched in 27 major league games, including three games each with the Detroit Tigers and Chicago White Sox, and the remainder with the St. Louis Browns. His major league record was 2-10, with an ERA of 4.10. In the minor leagues, Wiley Taylor played not only for Ellsworth, but also for teams in Austin, Louisville (KY), Lincoln (NE), Jersey City, Nashville, Salina, and Topeka. After his baseball career, Taylor remained in Pottawatomie County, where he farmed and served four terms as the county sheriff (1925-28 and 1945-48). Late in life, he also ran a service station and recreation parlor in Westmoreland, Kansas. Wiley Taylor died at the age of 65 in 1954.